Campeggio Strasko si trova a Novalja, Lika-Segna, è situato vicino al mare. Questo campeggio dispone di piazzole delimitate, sia ombreggiate che, senza ombra e piazzole poco ombreggiate. Camping Strasko si trova nei pressi di una spiaggia sassosa. È possibile affittare bungalow. Il campeggio dispone di un parco giochi, di un parco giochi al coperto e di un campo sportivo. Per gli sportivi, il campeggio prevede un programma di escursioni e diversi percorsi in bicicletta. Ci sono un programma di animazione e uno spazio fitness. Per chi desidera rilassarsi dopo una giornata intensa ci sono idromassaggio e beauty center. Il campeggio dispone di una piscina scoperta e una vasca per i più piccoli. Nelle immediate vicinanze potete fare il bagno in mare. Al campeggio Camping Strasko è possibile praticare snorkeling, windsurf e sci d'acqua. Ogni anno un ispettore visita il Campeggio Strasko, controllando oltre 200 tra attrezzature e altri punti di interesse del campeggio. L'ispettore è un dipendente ACSI e non lavora per il campeggio. Družinam prijazen kamp, veliko animacij za otroke. Sanitarije čiste in urejene, zmotila nas je edino cena družinske kopalnice, ki je bila zelo draga (150 kun na dan). Glede na to, da ceno vode in elektrike plačamo že v ceni kampiranja ...Torej, je to plačano dvakrat. It is a great campsite. It\'s calm and quiet, people are nice, the community in there is cool, you feel safe and you feel safe to leave your stuff anywhere. I would really recommend it. If I wrote this review 2 years ago,those grades wolud be the highest.If I were asked then I wolud say that this was the best camp on Adriatic coast.But then things went down hill. - Entertainment staff is extremely unkind,and their program is extremely poor.But the biggest problem of camp entertaiment is that quarter of activities on that program are not happening. -Toilet facilitys are poorly maintained,and it is not rare to see empty soap dispenser or no toilet paper.The biggest 2 sanitars(sanitar 2, sanitar 3) are outdated and your can see black mold in them. -If you want to learn to swear like a local,you should definitely spend some time with gardeners and cleaners because they are swearing their bosses 24/7. - One more thing I must say is the perfect location of this camp, it is near to the city center, Zrce beach is far just enough so you can sleep at night,but if you\'re here because this beach it is really good connected with the Camp with public transport. In the end,This camp is good,and proof for that is the 8000 satisfied guests every day, but there is a lot of space for improvement,and hopefully next year I will see kinder staff,a bit better mantained toilets and better entertainment services. Campsite in very nice location, orderliness and cleanliness in high level. Many flowers inside campsite. For main season need to reserve pitch for camping. The site is an excellent place to go,ideal for the children. Not far from the beach. And also there are lovely new swimming pools. I was asked if I could think of anything that could improve the site. I did mention that it could with a BBQ wash area as they get real dirty and fatty. And they said they would into it. In fact most sites should implement this as we as caravaners use gas BBQs and you won\'t be embarrassed when you can wash them in an delegated area. Other than that the site and staff are brilliant and very helpful. Water of swimming pool in the End of June was very Cold as Well as Sea and IT was not comfortamle to swim in IT. Grom that reason IT should be heated. Wow!! - what a site - this site has everything you could wish for - great staff and very clean facilities and although a very large site it is well spread out and quiet.There are several shops and restaurants on site and are very reasonably priced.A 15 minute walk into town with small harbour and lots of bars and restaurants. My only gripe was the WIFI and it's free but weak signal and where we were pitched we could not get a signal - overall one of the best sites I have been on. A great camp site, superb toilet facilities, the terraced places are spacious with water electricity for every pitch. A mobile bakers was extremely handy. Easy access to Novalja with the mini train. The wi-fi was great if close to a hot spot, of which there were many. Overall highly recommended. You can see a short video I have made on YouTube "campsite Strasko"
We arrived mid afternoon and left early next morning. The FKK section is tucked away behind screens and is just rocky earth under pine trees. The camp facilities for FKK are nil, you even have to go into the textile area to empty the chemical toilet. Toilet facilities are good but segregated M/F. The beach area was virtually non-existent. This was only our second naturist site ever - had it been the first we would never have tried another. It contrasted badly with other campnigs at Cres, also only partly naturist but there the FKK part is integrated within the middle of the textile (clearly indicated and by the FKK section of good beach), leaving it to the visitors to decide where to go bare and where not to. That freedom was not abused by either naturists or textiles. Volete prenotare il campeggio Campeggio Strasko o oppure saperne di più? Potete farlo usando i seguenti dati oppure tramite il sito del campeggio. Sulla M2/E27 si consiglia il traghetto Prizna-Zigljen, prima di Novalja a sinistra e seguire i cartelli. In alternativa: A1, a Posedarje svoltare per Pag (43 km) e continuare per 32 km, prima di Novalja a sinistra. 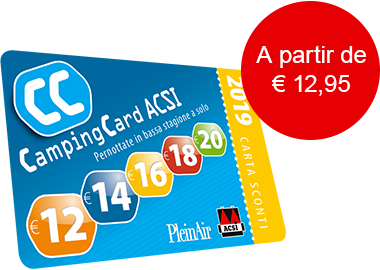 ACSI Eurocampings invia la tua richiesta di informazioni al "Campeggio Strasko".